The RLSP chief again targeted Bihar CM Nitish Kumar and BJP and said the state government has failed on the issues of education and law and order. 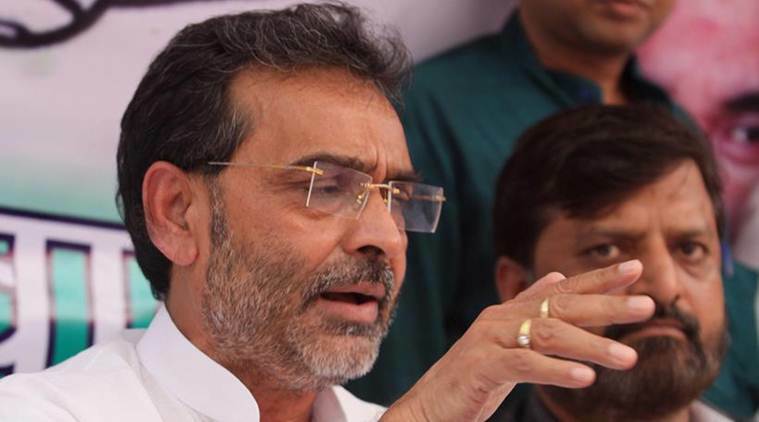 In an indication of imminent split from the NDA, RLSP chief Upendra Kushwaha Thursday invoked poet Ramdhari Singh Dinkar and said in Motihari that “ab yaachna nahin rann hoga (now there will not be a request but a fight)”. RLSP sources said that Kushwaha could announce the split after results of the Assembly polls in five states. Kushwaha has also delayed his decision to split from NDA as he has not been able to “strike a final deal with RJD”, sources said. The RLSP chief again targeted Bihar CM Nitish Kumar and BJP and said the state government has failed on the issues of education and law and order. “CM has not been using his favourite word ‘sushashan’ (good governance) these days. He knows there would be immediate reaction if he does. He is a master of words. After the Muzaffarpur shelter case, he said ‘hum sharshar hain’ (we are ashamed). But Supreme Court reprimanded his police for not adding important sections… Time has now come to uproot this government,” said Kushwaha. Taking on BJP, the RLSP chief wondered how the party did not make an effort to construct a temple when it was in power. “It is not right to talk of temple construction when election nears,” he said.